Noryangjin is a rather special area in Seoul, home to the largest fish market in the city and full of cram schools (학원) where children go to study late at night. With so many students frequenting the area, it’s no wonder there is a plethora of cheap street stalls to make for one fun, food-filled excursion. When my friends invited me to visit the area, I was more than willing to oblige! Numbers correspond to where the stalls are. The place is packed with all sorts of people, but it’s well worth exploring. 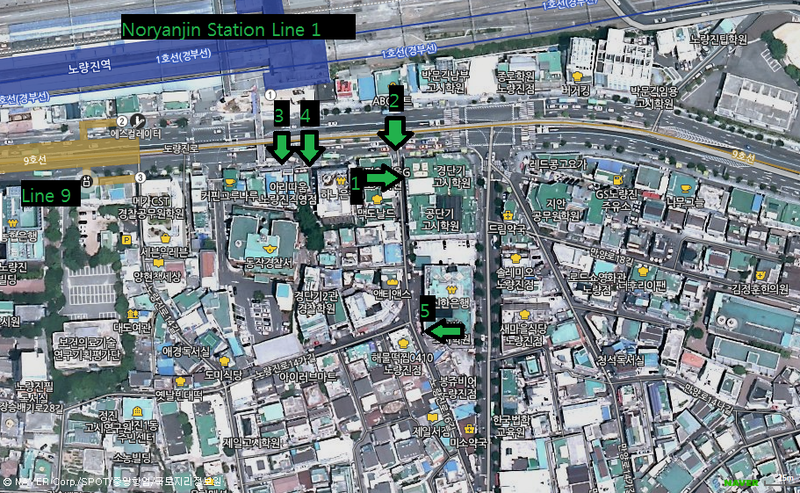 You can find this place by simply going to Noryangjin Station (노량진역) Follow the numbers on the map to figure out where these places are. Very similar to Real Kimchi Stir Fry Rice except with different options for ingredients. Their portions feel a tad smaller and their prices are fairly similar. We ordered the #1, which had a reasonable amount of ingredients minus the one lonely sausage. It was still very tasty and a great deal for 3000 won. They have a display of dishes out on front, and you can just point to the one you want if you have less than stellar Korean. They go through a lot of ingredients. Unless you’re into saucy soggy noodles, I would pass on this. The flavor was okay, but it was hard to eat because the noodles were so slippery. This waffle shop wasn’t too bad. They give you neapolitan flavors dressed with some whipped cream, syrup, and some cookie bits. My only issue was that the waffle wasn’t warm, as it was sitting there for a while. My favorite waffle shop is still and probably will always be in Hongdae (홍대) which is half the price and always made to order. One of the more unique items I’ve seen. Pieces of grilled chicken in a tteokbokki sauce with melted cheese on top. I liked this dish, but the chicken itself was a tad bland, almost as if it were boiled instead of actually grilled. Luckily the sauce and cheese make up for this. This place also sells traditional skewers, but it doesn’t look nearly as good as 삘꼬치네. This place has only one flavor that changes with the day. It’s a bit more simple, but I enjoyed this more than the other place because of its simplicity. Whip cream and strawberry ice cream drizzled with a little chocolate syrup. Can’t complain there. And of course a visit to Noryangjin isn’t complete without visiting my favorite place. Unfortunately, I was quite full from all that we ate, so I had to take half of it home. Click here to see the individual review. It’s quite a bit further from the other stores unfortunately, but I think it’s quite worth it :). Those looking to find more unique street food vendors than your typical tteokbokki place will be pleasantly surprised. Noryangjin is truly a street food paradise, with tons of established restaurants to add to the mix. They also have a few arcade stores which is pretty unique. I highly recommend checking it out as there is a little bit of everything for everyone here. Previous Previous post: Korean Foods Explained: What is Tteokbokki (떡볶이)?